Wide add-on parts, a powerful rear wing and a power output of 441 kW (600 hp) – the Audi TT clubsport turbo impresses with its power and design. From May 13 to 16, Audi will be showing its technology concept car on the Wörthersee Tour in the Austrian town of Reifnitz. The inspiration for the show car came from the successful Audi 90 IMSA GTO of the late 1980s. A new technology is making its debut under the hood. The car’s electric biturbo adds even more dynamism to the driving experience with its spontaneous response. The Audi TT clubsport turbo has a power-boosted 2.5 TFSI engine with very impressive performance data. From 2,480 cc of displacement, the five-cylinder engine produces 441 kW (600 hp) of power and 650 Nm (479.4 lb-ft) of torque. More than 600 Nm of torque are available between 3,000 and 7,000 rpm. This means that it produces 176 kW (240 hp) and 260 Nm (191.8 lb-ft) per liter of displacement. Power is transferred via a manual six-speed transmission. Thanks to systematic lightweight design, the TT clubsport turbo show car has an unladen weight of just 1,396 kg (3,077.7 lb). The car completes the standard sprint from 0 to 100 km/h (62.1 mph) in 3.6 seconds, and its top speed is 310 km/h (192.6 mph). The TT clubsport turbo plays out its big advantage over the first few meters of a sprint. Its electrically driven compressor lets it cover up to 16 meters (52.5 ft) within the first 2.5 seconds – which is six meters (19.7 ft) further than a comparable car without this innovation. That is a difference of around one and one-half car lengths. An electrically powered compressor offers significant advantages: It revs up to maximum rpm rapidly and without any perceptible delay, and it continues to boost charge pressure when too little drive energy is left in the exhaust gas for the conventional turbocharger. This operating principle makes it possible to design the conventional turbocharger more specifically for high charge pressures and consequently for high engine power – the e-turbo assures spontaneous response and powerful sprints from low engine speeds at all times. The effect is impressive. The 2.5 TFSI engine builds up its tremendous power without any perceptible delay. This power is available in any situation – whenever the accelerator pedal is pressed. 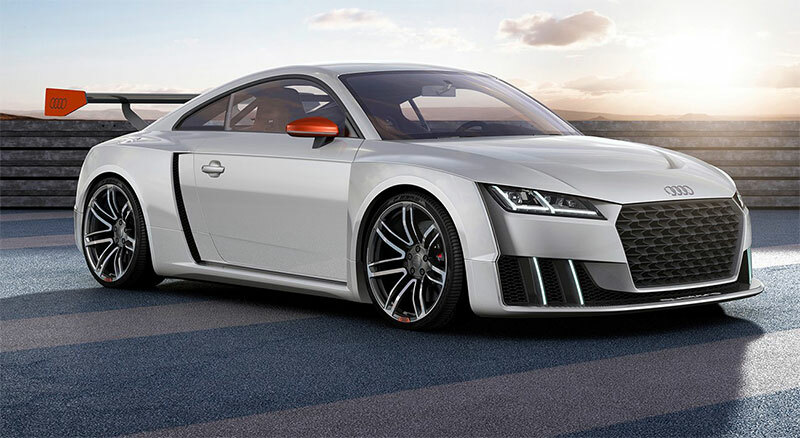 In an acceleration duel, the TT clubsport turbo effortlessly pulls away from a counterpart with an identically powered engine but no electric biturbo. However, it is not just the power of the five-cylinder engine that is fascinating – so is its unmistakable throaty sound. The exhaust system is designed for minimal back-pressure; a side pipe to the ambient air is located immediately after the racing-type muffler. The 2.5 TFSI engine is cooled by a racing-type radiator. In the lower engine speed range, the electrically driven compressor boosts torque by up to 200 Nm (147.5 lb-ft). A dedicated 48‑volt electrical sub-system – another key future technology from Audi – supplies electrical energy to the turbocharger. A compact lithium-ion battery in the luggage compartment stores the energy that is generated by recuperation when coasting. A DC/DC converter provides the connection to the 12‑volt electrical system. The power of the Audi TT clubsport turbo reaches the road impressively via a quattro permanent all-wheel drive system whose multi-plate clutch is mounted on the rear axle for better weight distribution. A coilover suspension system enables highly precise adjustment of the body’s ride height and the compression and rebound of the shock absorbers. An electric lifting function protects the equipment from damage by street curbs. Electronic stabilization control (ESC) and torque vectoring round out the dynamic qualities of the suspension ideally. The show car’s wheels are size 9.5 J x 20. Their six twin-spoke design is finished in a bi-color look – both gloss turn finished and matt black – and the tires are size 275/30. Carbon-fiber ceramic brake discs are mounted behind all four wheels; they are very lightweight and wear-resistant. The front brake discs measure 370 mm (14.6 in) in diameter. The compact sports car takes a full stance on the road with track widths of 1,736 mm (68.3 in) in front and 1,729 mm (68.1 in) at the rear. The car is 4.33 meters (14.2 ft) long and 1.97 meters (6.5 ft) wide, including the side mirrors – 14 cm (5.5 in) wider than the technical platform upon which it was based. Its angular fenders contribute a separate additive shape to the car body. They take the characteristic design motif of the Audi TT* to an extreme and accentuate the distribution of engine power to all four wheels – the quattro drive. The fenders of the show car – painted in the exterior color Ferro Titanium – are open at the front and rear. Air from the car’s slipstream flows through them to cool the brakes. The Singleframe grille and large air inlets – whose vertical fins form a continuation to the light signature of the Matrix LED headlights – are also optimized for maximum air throughput. The manually adjustable rear wing is an advanced development of the Audi Sport TT Cup with which the brand very recently launched a dedicated race series. It is now 20 cm (7.9 in) wider, and the side flaps, which feature the four rings, were given a new geometry. The wing consists of carbon-fiber reinforced polymer (CFRF) as do all other add-on parts: the air inlets and the large splitter at the front, the side panels and side sill trims as well as the voluminous diffuser at the rear whose lateral segments reference the motif of the air inlets. A protective “cage” of ultra-high-strength titanium tubes makes the rear zone of the interior even more rigid and safe. In front, there are lightweight race car bucket seats with four-point harnesses. The display and operating concept with the digital Audi virtual cockpit focuses on the driver, who can control all key driving parameters via four satellite buttons on the multifunction steering wheel. Sporty materials such as CFRP and black Alcantara define the interior of the Audi TT clubsport turbo. The race seats are upholstered in coral orange Alcantara and feature contrasting stitching and piping. In the doors and on the center console, CFRP parts with their large surfaces create sporty accents, and the doors are closed by pulling on a tube-shaped grip with an Alcantara inlay. The air vents and gear shifter also have coral orange accents – the aluminum gear shift lever travels in an open shift gate.